Sink your gnashers into a warm, soft wrap filled with juicy spiced lamb, crunchy slaw and freshly picked wild garlic. Dorian Kirk of A Rule of Tum shows us how it's done. Wild garlic is a free and abundant gift of the woods this time of year and is perfect in soups and salads. It's especially good wilted in butter with poached eggs. But if you fancy packing a real flavoursome punch, give wild garlic pesto a whirl, sprinkled on pulled merguez spiced lamb, celeriac and yoghurt slaw, pickled onions and roast peppers and rocket, served in a warm wrap or with flat breads. Imagine sinking your gnashers into that on a sunny spring day. Toast the whole spices in a dry pan. Whizz them in a coffee grinder with the cinnamon stick pieces, cayenne pepper, smoked paprika, salt, garlic and rosemary. Mix the whizzed spices with enough olive oil to make a sticky but loose paste, smother over the lamb and marinade overnight. Cover lamb with water or stock, cook at 130˚c for about 5 hours until falling of the bone. Strain the liquid into a pan and reduce by two thirds. Pull the lamb, discarding any bones and sinew. Pour the reduced liquor over the pulled lamb and reheat when ready. For the peppers and onions, bring the 500ml red wine vinegar to the boil with the sugar. Add the sliced onions, stir and leave to cool, preferably overnight. Coat the peppers with oil and roast on high heat for 15 minutes until it blisters, sprinkle over the garlic and rosemary for the final 5 minutes, remove, sprinkle with the 100ml red wine vinegar and cover until cool. Once cool, peel and slice. Strain the onions and mix with the peppers. Mix together the mayonnaise, yoghurt, seasoning, sugar, garlic and mint for celeriac slaw. Pour over the celeriac and cucumber, mix thoroughly and season to taste. For the wild garlic pesto, blitz all the ingredients except the oil in a food processor until fine, slowly add the oil, adjust the acidity and seasoning to taste. Serve the hot lamb, slaw, pickles and pesto with wraps or flat breads and rocket. 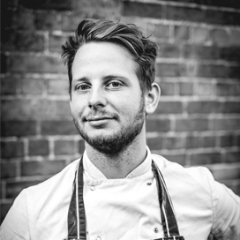 Dorian Kirk is head chef of A Rule of Tum, a supper club based in Herefordshire. A Rule of Tum is about creating honest, seasonal dishes crafted from the ingredients they find right on their doorstep.